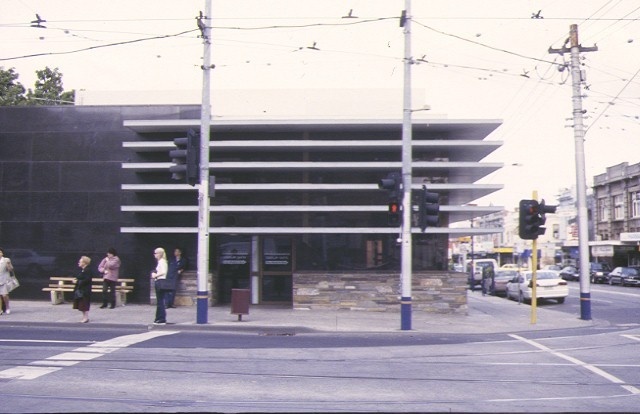 The Former ES&A Bank on the corner of Glenferrie Road and High Street Malvern was constructed by Swanson Bros. Pty Ltd in 1959 to a design by the ES&A Bank Architectural Department headed by Stuart McIntosh. The consultants for the project were structural engineers WL Irwin and Associates and Prentice Builders. 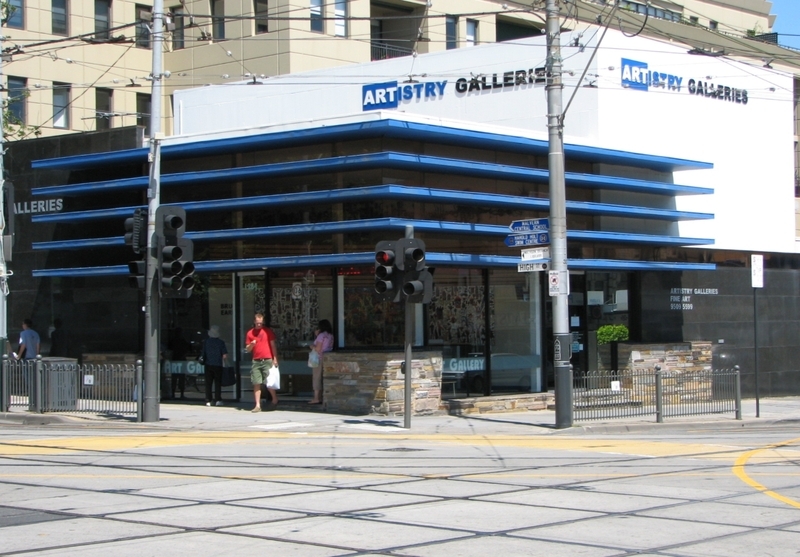 The prominent site at the intersection of High Street and Glenferrie Road was first purchased by the English Scottish and Australian Bank in 1885 and the current building replaced a two storey red brick building. The design of the former ES&A Bank was stridently modern for its time with an interesting composition of planes and solids. The use of the 'brise-soleil' on the north and west is particularly striking due to its oversized deep fins. The composition makes use of large vertical planes in coursed dark polished granite and Gosford sandstone, strip windows in pink tinted glazing, and a feature garden planter bed around the base of the bank in Castlemaine slate. These architectural features wrap around what is in effect a large sandstone and cement rendered cube whose interior forms the banking chamber which is featureless save for the internal planter box and a metal mural by sculptor Charles Bush. The Former ES&A Bank, corner Glenferrie Road and High Street Malvern is of architectural, social, scientific and technical significance to the State of Victoria. The Former ES&A Bank, corner Glenferrie Road and High Street Malvern is architecturally significant as possibly the most striking modernist suburban bank design in Victoria. Designed by the ES&A Bank Architectural Department headed by Stuart McIntosh, at a time of great architectural interest in the use of the 'brise-soleil', the composition uses contrasting vertical planes of materials and colour along with an architectural play of intersecting vertical and horizontal elements where the overly deep 'brise-soleil' wrap around the north and west faces of the building. The coursed dark polished granite used in veneer walls directly contrasts with the random base stone work, the planes of pink glazing and the light coloured sandstone (since painted) of the projecting cube which forms the bank chamber. The bank chamber is also of interest for its metal mural by sculptor Charles Bush. 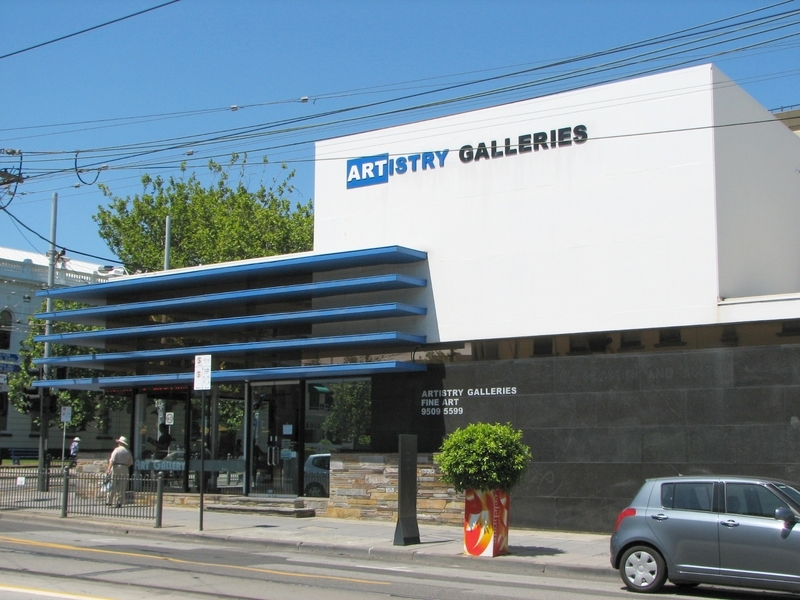 The Former ES&A Bank, corner Glenferrie Road and High Street, Malvern represents scientific and technical innovations in the use of sun shading devices (brise-soleil) as a climate control feature that is integrated into the building design. The Former ES&A Bank is of social significance and representative of a class of building in that it expresses the physical manifestation of the post war expansion of retail banking. Although this building is of a non-traditional form, it incorporates materials historically associated with banking construction ie: granite, sandstone and marble, to communicate the characteristics of security, permanence, impregnability and privacy of banking transactions. Former ES&A Bank, corner Glenferrie Road and High Street, Malvern, Stonnington City Council. 1. 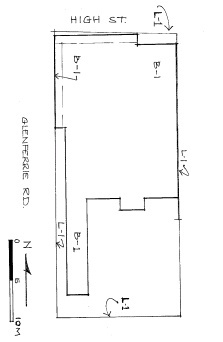 All of the building marked B-1 (including eaves and overhangs) on diagram 604026 held by the Executive Director. 2. All of the land marked L-1 on diagram 604026 held by the Executive Director being all of the land described in Certificate of Title Volume 8347 Folio 683. The most comprehensive study of bank buildings in Victoria was conducted in 1976 by Bruce Trethowan who surveyed banks constructed between 1851 and 1939 (ie beginning of WW II). The survey showed that a substantial number of premises constructed were constructed in the 20th century directly after the end of the First World War. At the end of WWII and for some years after building was at a virtual standstill until wartime exigencies were eased. In America the war had built up large factories and had caused the development of new materials and processes. Many of these found there way into peacetime building construction. In Australia the mass production of new materials was not as marked. Factories such as the vast munitions works at Footscray and Maribyrnong were at a virtual standstill. What was noticeably similar was the need for housing the population boom brought on by the end of the war. New suburbs sprang up with housing being mass produced in lightweight materials; brick construction was replaced by steel and timber, timber construction by fibro and glass by the acre came to be the new curtain walling for both the house and the high-rise office buildings which were exceeding the old building height limitations. One of the new materials was aluminium which was used extensively as glazing mullions and frames in these buildings. Aluminium was mass produced for the first time during the war to make aircraft parts and the production techniques were transferred from the war effort to building products. The first high rise to show-case the new material was the Alcoa headquarters building in Pittsburgh of 1952 by Harrison and Abramovitz. Particularly notable high rise offices in Australia were ICI House (1955) and MLC North Sydney (1956) both by architects Bates Smart McCutcheon. Old limitations of form and materials were breached as architects eyes were opened by war time experiences. Robin Boyd was perhaps the most publicly noticeable of the post war messianic architects, preaching an architecture for the age. Some of his exemplars are the Gillson House Balwyn of 1951, the Richardson House (Bridge House) Toorak of 1953-54, and the Ctesiphon House and Supermarket Jordanville of 1952. Architects Grounds Romberg and Boyd designed radically new buildings such as the Academy of Sciences Canberra of 1958, and Grounds the Arts Centre spire (not the present design) circa 1960. Dynamically expressive buildings such as the Olympic Swimming and Diving Pool by K Borland, J & P Murphy, and P McIntyre of 1956 and the Sidney Myer Music Bowl by Yunken Freeman Bros. of 1959 took materials to their economic and Olympian limits. Internationally architecture found new prominence particularly in the works of Corbusier, Saarinen, Niemeyer, and Mies van der Rohe. The bank was designed in the offices of the ES & A Bank’s Architectural Department headed by Stuart McIntosh. The drawings are signed by architect Robert Garner who project managed the construction and issued design change drawings. The builder was Swanson Bros. P/L. Stuart McIntosh was born in Adelaide in 1924 and educated in Corowa NSW. During the Second World War he served in Borneo and Papua and New Guinea and on return attended architecture school at the University of Melbourne. Following graduation he worked for Yunken Freeman Bros and then worked for the ES & A bank architecture department from 1952. In 1954 he became the banks chief architect for Victoria. Other banks by McIntosh were ES & A’s Traralgon and Parkdale branches. The new Malvern building caused the demolition of the banks existing two storey brick premises, the bank having occupied this site since 1885. The final design was strikingly modern with its use of planar materials, strip windows and the very deep (approx 1450mm) window shade fins along the main north and west elevations. The ES&A bank in Malvern is in contrast to the structural-functional ideas of leading Melbourne architects such as Peter McIntyre and Kevin Borland, and to the structural expression of the International Style led by Frederick Romberg and Robin Boyd. Modern architecture has celebrated stuctural 'truth', and this building's expression of abstract and sculptural compositions lay outside mainstream, orthodox modernism.